It’s last doors time for one of the most talked about exhibitions of the last 12 months. Grayson Perry’s thought-provoking and eccentric residency at the British Museum comes to an end this Sunday 26 February. The exhibition allowed Perry to bring together a myriad of chronologically and socially diverse pieces from the heart of the British Museum’s vault set along side his own contemporary work. That word; ‘contemporary’ becomes the focus of the exhibition. “Everything was contemporary once,” says Perry as he challenges us to revaluate the criteria we use to determine artistic and social value. In the course of this wonderfully curated exhibition, Perry elevates his childhood Teddy bear into a microcosmic world of his own creation. His own fantastic sense of imagination interweaves with historical relics from all four corners of the world spanning millennia in their provenance. The remarkable achievement of the exhibition is the seamless consistency of the aesthetic message despite the individual pieces' varied origins. Short incisive explanations and observations, written by Perry himself, are dotted amongst the exhibits and should not be ignored. The scope of subject matter approached is staggering from authenticity to craftsmanship to sexuality. Yet there is a tremendous sense of adventure and fun in the approach and not once is there a feeling any dogma is being asserted. By Sunday evening this exhibition will disband sending its individual pieces back to their various homes after which they will never meet again. Perry has managed to achieve an incredible commentary on the art world but more importantly on the issue of modernity itself. Do everything you within your power to make it before closing time come Sunday. 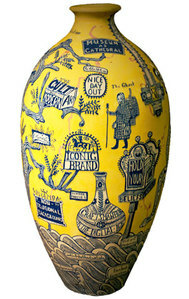 Grayson Perry: The Tomb of the Unknown Craftsman closes on Sunday 26 February. All advance tickets are sold out so you will have to queue to get same day tickets from 9am or become a member to get free unlimited entry to this and all exhibitions. Tickets £10. The British Museum is open till 8.30pm tonight.